Stisla, a lightweight Free Bootstrap 4 Personal Website Template with PHPMailer, Parallax, Sweet Alert, Smooth scroll and more. On the first glance, the HTML template we are about to introduce, might not seem overwhelming. Nevertheless, the idea is quite simple nowadays, Less is more! Turns out, it’s a perfect Free Bootstrap 4 Personal Website Template. Powered by some modern technologies and features like PHPMailer, Parallax, Sweet Alert, Smooth scroll and more, today’s freebie is “Stisla”. 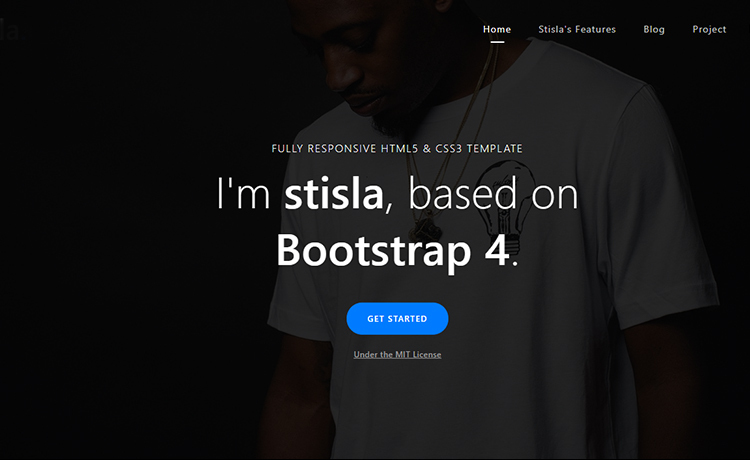 Stisla might not contain a vast amount of sections but what it has is ample for a Free Bootstrap 4 Personal Website Template. This Bootstrap template welcomes your visitor with a full width text over a cool parallax image at the homepage. As you continue, you’ll notice a comfortable scrolling experience because of the smooth scroll. In addition, a sticky navigation bar will accompany you all throughout this one-page free HTML5 template. Then, various plugins make this personal website template more useful. For example, sweet alert plugin hands you the opportunity to play with different colors and styles of the buttons. Afterwards, PHP Mailer plugin helps you to control the contact form located near the bottom. Bootstrap 4 framework ensures awesome responsiveness. This modern template has some additional essential sections as well. A blog section is available for you to share necessary details, stories or tips. An e-mail subscription box is also present. Moreover, the web template also contains a featured section as well. Features like call to action, ghost button increase its usability. Icons from Ionicons alleviates the visual. Lastly, there is Google maps built-in on this professional yet straightforward template. If you’re new to ThemeWagon or feel interested to know more, explore our website. We, distribute some real top-class free & premium HTML5 templates. Posh is our flagship product which has the ability to transform into any of website. Additionally, we update our blog regularly. For example, here is a post about some portfolio websites with cool design.